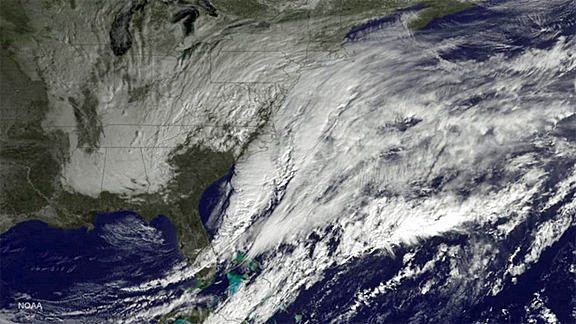 [SatNews] National Oceanic and Atmospheric Administration (NOAA) has released a new satellite image of the massive winter storm currently making its way up the East Coast. Satellite image is courtesy of NOAA. The storm began as a low-pressure system in the waters off the Carolinas and has since spread all the way up the coast. Cities from northern New Jersey all the way up to Maine are expecting heavy snowfall—in some cases up to several feet. Parts of New York City could see as much as 36 inches, and Boston and Philadelphia could see up to 24 inches. A blizzard warning currently stands for much of the Northeast and is expected to remain in effect until early Wednesday morning. The projected snowfall makes this weather event a contender for a spot among the top five worst snowstorms in New York City alone—weather forecasters have called it a "potentially historic" storm for the Northeast.